Thanksgiving week is over, and we fished our way through it. 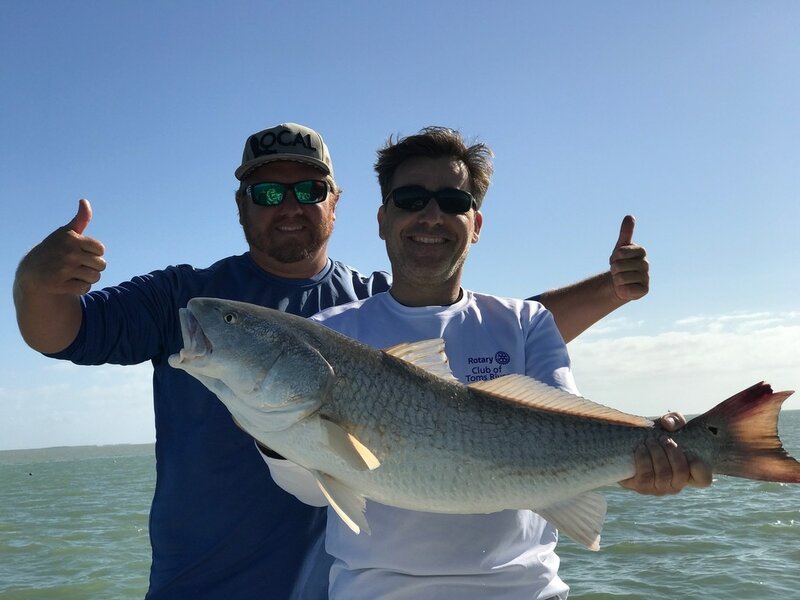 The fishing was phenomenal with excellent numbers of redfish and snook in the backcountry, Jacks and Barracudas in the channels and Snapper and Grouper on the patch reefs. An excellent time was had by everyone! With some amazing fish dinners had by a few. Now is the time to be fishing if you like variety and action. Come see me the fish and I are waiting! It's that time of year again. The weather is getting nice and the Tarpon are showing up in droves. We have already landed our first handful of full size Migratory Tarpon this season. Come try your hand at taming the Silver King. Live baiting with Mullet or Pilchards seems to be the key now, but crabs and large shrimp will come in to play soon. Call me up for the few days I have left in May -June for your chance to boat the beast! Snook Season is back open here in the Florida Keys. 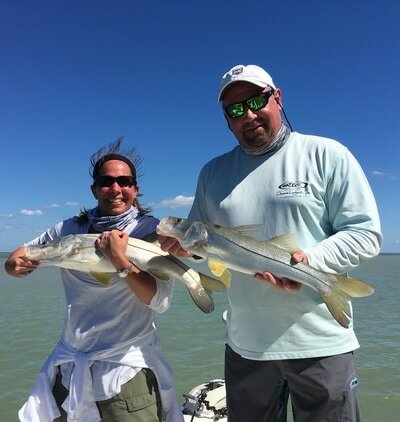 Although we target Snook all year this gives you the opportunity to keep a Snook if so desired. The regulations are tight and the limits are low to protect these amazing fish. Along side Snook you will find Redfish, Sea Trout and the ever tasty Mangrove Snapper. The best way to target this drag screaming species is with a live bait along shorelines. Although they may be fished with artificial in channels or on the flats. Give me a call if you want to get out and try your hand at these beauties! Spring Break is just around the corner and spots are filling up fast. The fishing is hot and the weather is warm. 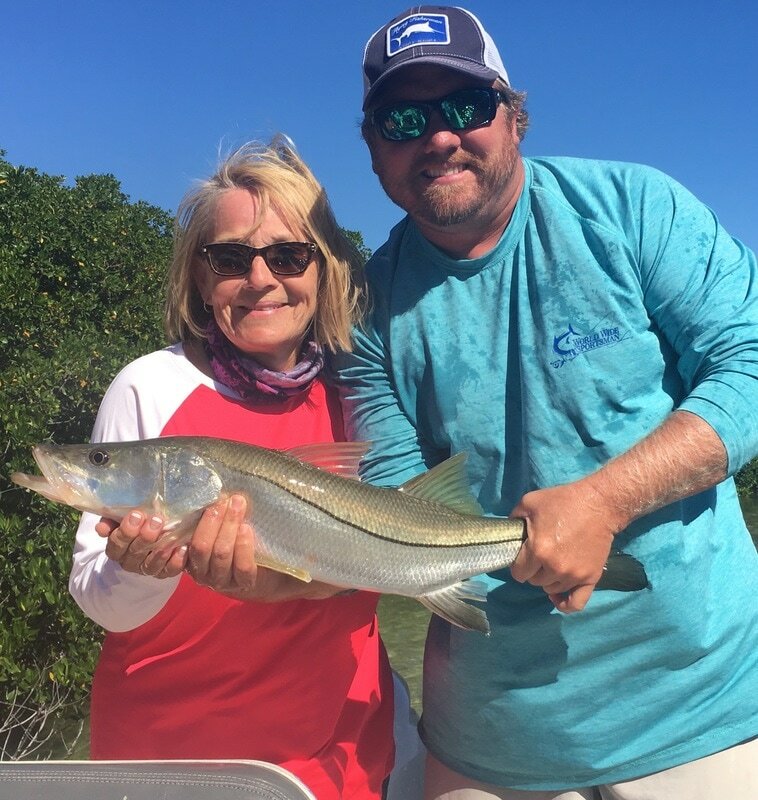 Catches of double digit numbers of Snook have been more often than not. The Spanish and King Macs are still here and hungry. 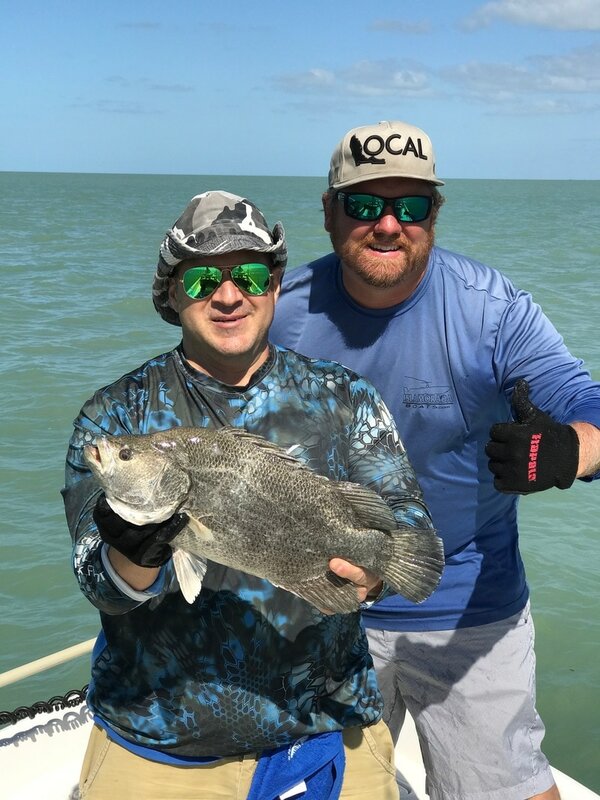 Triple tail has been a little spotty, but the ones we have caught have been over the minimum and have made some great dinners. Had a couple of buddies from Jersey out that had a banner day with a large triple tail and a MONSTER Redfish. Call me up and get your trip on the books! With the heat of summer upon us it's easy to think. "Oh its just to hot to fish". To avoid the heat I always suggest two things. The first is leave earlier when the sun is still coming up and the temps have yet to rise. The water temps are cooler and the fish are more active. This is especially true for species such as Tarpon. 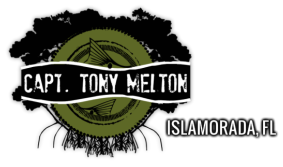 Although Tarpon season is over we still have opportunities for the silver king. We also have what i like to lovingly call the silver prince or baby tarpon. The Juvenile fish that haven't grown large enough for the annual migration. I like to target these little acrobats with artificial baits such as D.O.A. Cal or D.O.A Shrimp. My other suggestion for the not so early risers would be a late afternoon/evening trip. This trip would leave four or so hours before sunset and be heading back to the dock in the glow of sunset. Jack Crevalle and Sharks would be likely suspects in this endeavor. Hard fighting under appreciated fish that can be as aggressive as anything out there. As the holidays approach us and we begin to make plans some of us think about winter and snow and the traditional things, while others plan vacations to get away from those things. The holiday break is a very busy time for charter fishing and guides here in Islamorada. 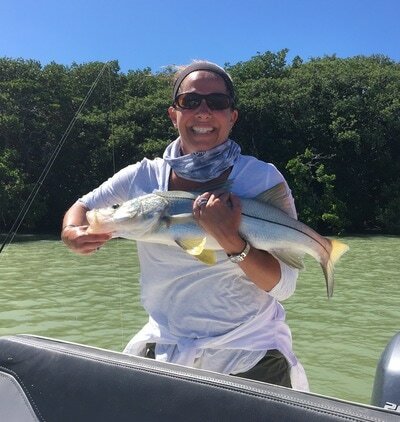 We do a lot of fishing with families and beginners during this time as well as seasoned anglers. It is not uncommon to see me with a Mom, Dad, and a couple of kids with rods bent and smiles on their faces. I enjoy greatly fishing with these families and teaching and helping these kids to learn something new. I even sometimes offer a 2 hour charter for the younger children to dip their toe in the fishing pool. Typical catches for these types of charters this time of year is Snappers, jack, and small barracuda and sharks or sea trout. We tend to focus on catching fish rather than the size and species. I've found that it is better to keep them busy and laughing and smiling than chasing the big fish. If you are or aren't a fisherman or woman and are going to be in the area I highly recommend giving it a try. I think you will be surprised by the fun you will have. Sometimes you really just want to get away from it all. You want to feel the quiet tranquility and be one with nature. (While still fishing of course) I have a charter to accommodate just that. While feeling completely disconnected from the world and satisfying that exploratory urge we get from time to time. We travel deep in to the everglade where access is limited to boats only. NO Roads, No Cars, and NO PHONES! Just you, your rod, and the fish. You will see very few boats (if any) so you can relax and enjoy the serenity. 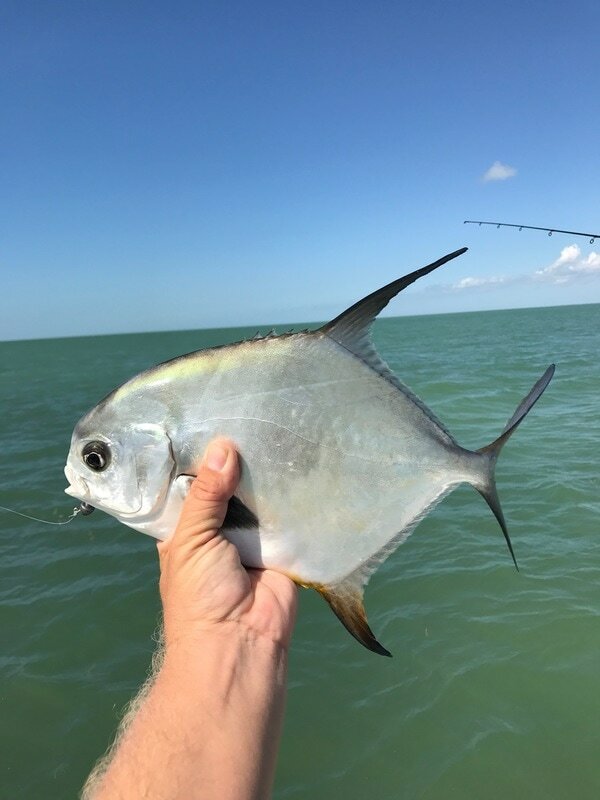 This charter is a minimum of 8 hours and you should be prepared for a longer than normal boat ride, but you will have opportunities to cast at fish that get very little pressure. On my last excursion deep in to the depths of the Everglades. We caught over 30 Redfish and just as many Snook if not more along with Tarpon, Ladyfish, Trout, Jack Crevalle, Sharks and more. As well as seeing Bald Eagles, American Crocodiles, Alligators, Raccoons, and so much more. You will feel like Lewis and Clark exploring all new lands and enjoy being off the grid.